Andie @ukandie1 and I headed to the zoo today so I could do further tests with the Nikon Z7. Today my focus was on cropping - and how it handles it while maintaining details and clarity. I've continued to be pleased with this mirrorless. But I learned today the adaptor apparently only works with Nikon lenses, so I couldn't use my Tamrom super zoom with it. A wonderful close up of this pensive giant, fav! That is one darned impressive photo Taffy, you've captured the expression and mood so well. Bummer about the lenses though. What a wonderful image. I often wonder what gorillas are thinkkng when their lives are spent in zoos. Shame about the lens. He looks very deep in thought. I wonder what he is thinking. Great shot and details. Beautiful in b&w. Marvelous focus and crisp details in this gorgeous old soul’s face. Oh my. This is absolutely stunning - as good as any of the best wildlife photos I have seen. Meant to add - fab on black. I hope he's not as sad as he looks... I don't much like zoos. Such an interesting learning curve for you. This is a remarkable portrait. There is so much to consider when you have got all of the kit. Im sure my head would explode. Looks like the camera copes well with cropping. There is plenty of detail here. I love his grumpy expression. Great expression, great detail despite cropping but how frustrating and disheartening re the Tamron. What to do? Very pensive fellow. How frustrating that you can only use Nikon lenses with the adaptor though! How is your camera? Is it recovered from its hospital visit yet? Didn't see this yesterday. It is beautiful. Fav! Beautiful portrait- the details in the eyes are very catching. I struggle with the gorillas... so pensive and complex. Still, a beautiful portrait. Pensive is exactly the word that came to my mind even before I read the title. 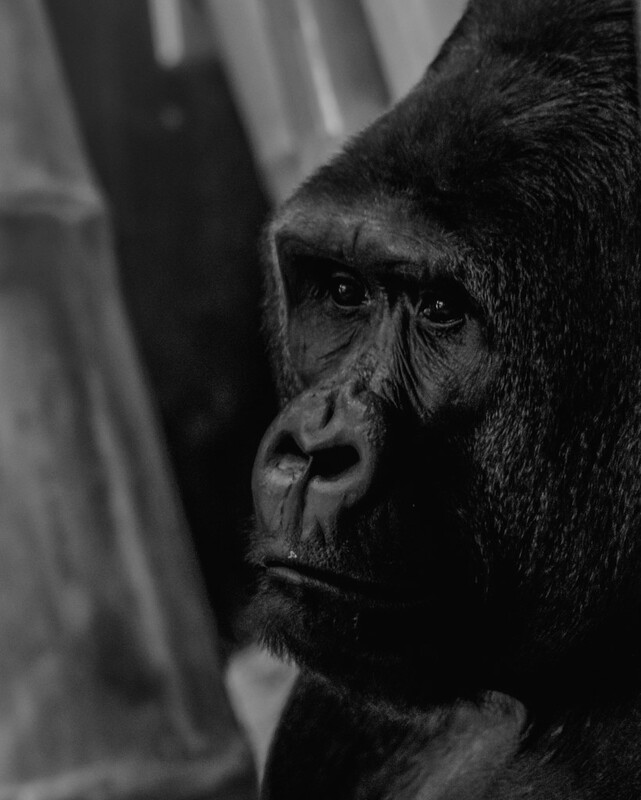 Beautiful profile of a pensive gorilla.